Baby, meet bathwater: you're about to be thrown out together. This year Congress passed the new Consumer Products Safety Improvement Act, which goes into effect in a couple of months (02/10/09). Now, they were trying to strengthen the safety standards on mass-produced toys, clothes, and accessories made in China, and to ban toxins like phthalates and lead. A worthy goal, who could be against that? Unfortunately the law was written carelessly enough that small toy manufacturers, independent artisans, and crafters are getting caught up in it...and face being pushed out of business altogether. The law requires new third party testing and labeling to prove that items don't contain toxic chemicals, but it applies across the board to everyone...including probably some folks you all have found on Etsy and are fans of. I'm no expert here, but this sounds ridiculous, and I urge you all to go to Cool Mom Picks to learn more and find out all the ways you can try to stop it. No, you know I loves me some recycled gear. You know I loves me some recycled aluminum can pop tab gear. I've got the purses, the cell phone bags. I've waxed rhapsodic about the earrings. I think they're clever, attractive, functional, affordable. I think they're little mini-word of mouth machines, because every time I wear this purse I get asked many questions about it. 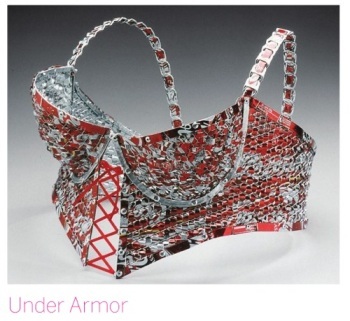 A pop-tab bra. See, I am not really sold by this piece of copy: "Can it be worn? Probably not and if it could be it probably would not be comfortable. Still it is quite attractive and colorful underwear. " Um, for what? Color me confused. Payless Shoe Source goes eco-friendly? Back in the day Payless Shoe Source used to be my only source for vegan shoes. Since my early veg days e-commerce has evolved so that it's much easier to find hip, cute vegans shoes, and I haven't been to a Payless in quite some time. Well, according to The Daily Green, Payless is now introducing a new, eco-friendly shoe line. I can't seem to find it on their web site yet, so I guess it's still in pre-launch. But I guess they wanna get in on that hip, cute vegan shoe action. I just may have to cross the Payless threshold again, because after all: I still can't afford these or these or these! Well, I never would have thought of this! Well, Starbucks may trumpet their use of post-consumer recycled materials for their coffee sleeves, but @katinlee on Twitter just pointed me to this post with an even more eco-friendly idea: Use a sweatband for your coffee sleeve. Brilliant! But The Toe Zone has an interview with on eof the co-founders of vegan shoe maker Charmone that remind me how much I lust after their shoes. Make no mistake: They are expensive. Many of the cutest styles have high heels, the likes of which I didn't even wear when I was young and spry. But I cannot deny the lust. I'm here in Las Vegas, getting ready to speak at a conference tomorrow, and I just discovered i forgot to pack the pumps I planned to wear during my presentation tomorrow. Instead I'll have to wear my boots. In Vegas. Which is 90 degrees. Ah well, back to reality. I'll be the chick in black boots despite the 90 degree weather tomorrow. What would you do in Paul McCartney's shoes? It's a McCartney kind of week at Elisa's Green Scene. Apparently in an effort to give Beatle Paul McCartney a special room, a hotel booked him in a special leather-on-leather-on more-leather hotel suite. He apparently didn't want to kick up a fuss and didn't ask to be moved. Even though, according to Ecorazzi, Paul is "one those vegetarians that avoids leather at all costs. In fact, he refuses to buy leather shoes and even asked for the leather interior in his Lexus car to be swapped for cloth." By "those vegetarians" do they really mean vegan? Would I ask to move rooms? Hm. I have asked for feather pillows and other bedding to be removed...but I know a lot of places do that for folks with allergies too, so I didn't consider that a huge request. BUt what if a room had a leather couch or headboard? No, truth is I probably wouldn't ask to be moved. Me and Paul: We're close like that. ...at least in the fashion industry to know that you don't put fur anywhere near a Stella McCartney design??? And yet a UK fur boutique created ads with their furs covering models wearing vegan designer McCartney's lingerie. Ads must to be pulled. And stupid, stupid stylist who borrowed the lingerie, apparently for another shoot, and thought it would be OK to use it for the fur shoot too. I'm thinking this may damage the stylist's career a teensy bit. I have nothing really to add, I just think it's a good story. Adorable recycled stuff...is it most eco-friendly stuff? See that necklace, made from "misprinted or discontinued MTA maps"? I love it. Think it's the most adorable thing. Hat tip to Great Green Goods for pointing me to them. And there are many other adorable things out there in a similar vein...made from old typewriter keys, Mahjong tiles and the like. But does anyone else wonder like I do whether turning such materials into individual jewelry pieces IS really the most eco-friendly use of said materials? I mean, let's say said materials were actually processed and turned into larger, usable items...it's the thought of splitting them up into many many small items that then have to get bought and shipped to many many locations. This is what bothers me. Does anyone else have weird thoughts like that...or am I a special sort of cynic? Featuring the work of Catherine Ledner, these whimsical shot of animals literally from A (as in alligator) to Z (as in Zebra) are set against different wall coverings, and on a variety of floor coverings. It is hard to imagine that she literally brought all of these animals into her studio and shot them against the apparent backgrounds, but there is no answer on her About page as to technique or methodology. The prices range from $250 for a small 11x14 print to $1700 for a 32x40 print. not being a photography collector I have no idea if these prices are reasonable or on the high end, but in perusing her gallery, or rather menagerie, I can say I'm tempted to find out! "We can be stylish and environment conscious in the same time"
I got an email from Fani Lioe from FaniSong Jewelry. She urged me to check out her new line of jewelry made from recycled glass and nature photography. A lot of it is really very pretty, and very affordable. Here's the Esty store for this line of work. I was a little afraid of the cord...would it be leather? But actually you can choose between ribbon or a suede cord, so we're good there. I have yet to fall to the siren song of Etsy like some folks I know, but stores like this may just reel me in.